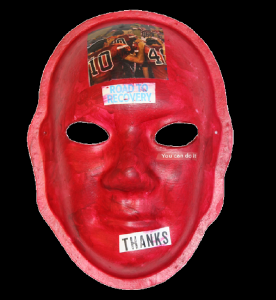 Explanation of Mask: On March 12, 2014, my life was changed when a 17-year-old going 110 mph T-boned my car. Every quadrant of my brain hemorrhaged. I died and was brought back to life. Ironically, the accident saved my life. I was anorexic, just a shell of a person. This tragedy was a blessing. My heart and head weren’t connected. 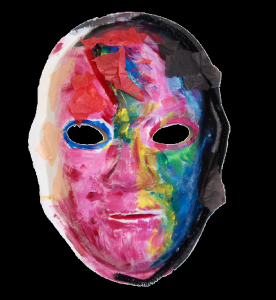 The left side of my mask shows me broken; living life for everyone else’s pleasure, not mine. During my rehabilitation I became strong and would fight, fight, fight. I progressed well. If they said I couldn’t, I said I could. 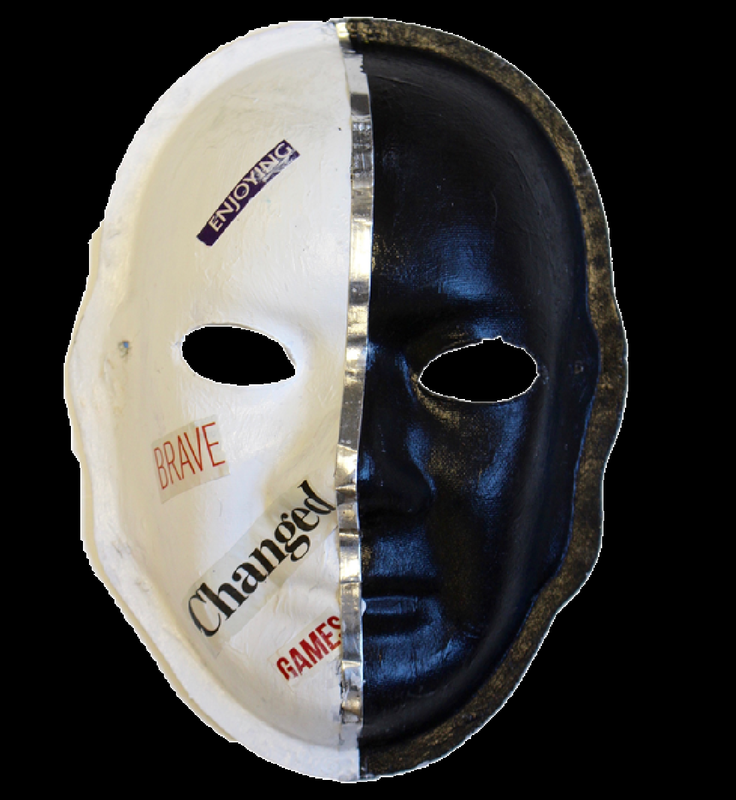 On the right side, my mask represents my new beginning. I now think outside of the box and have fun. I am living now, not just surviving. Today, I am experiencing feelings of anxiousness and anger, sometimes not trusting what I can or can’t do. What is my purpose? I have learned that you don’t recognize the strength within you until you have to tap into it. Brain Injury: I am Bill. I was born in 1960. In 1965, I was walking home from school and a car hit me in Evanston, Illinois. That is near Chicago. I have had a brain injury since I was 5 years old. I am paralyzed on my right side. My muscles are spastic; they have spasms. My brain damage makes me feel unstable. Sometimes I think to myself, ‘If I was stable, I could have been in the Army, Navy or Marines, or I could have had a perfect job.’ It would trouble me that I can’t do everything. It’s okay though. In the past, I didn’t feel good about myself because I was handicapped, but now I am happy where I am. I have 2 older sisters, one younger brother, and the best brothers-in-law. I love my family so much. They have been so good to me. Sometimes I feel I am a bother. I try real hard to be positive and certain of myself. I have accepted the things that I can do now. I am happy most of the time. Explanation of Mask: If you look at my mask, you might notice that I am a perfectionist. I wanted each feature of my face to be highlighted. Light blue is my favorite color, but I also like the other colors too: red, yellow, green and orange. This mask makes me feel happy, ‘pretty sweet.’ The pictures I chose are what I like such as music, trees, swimming, mountain climbing and wine. I love to watch people climb mountains. I can’t drink wine, but I would like to taste it. I love meat. My favorites are cheeseburgers, steak, fish, and hot dogs. I like fruit, too, but not as much as meat. I have so many things that I like to do. Fieldtrips are my favorite activity. Some say I can sing pretty good. I am in the Villagers Choir. I also play the tambourine. I am writing a book about ‘tang soo doo.’ It is Korean martial art. When I go swimming, it calms me down. It is ‘really sweet.’ I like to learn as much as I can each day. When I was younger, I would draw 70 pages a day, but I can’t now because my hands won’t let me. I had a teacher who told me to slow down; that discouraged me. When I was in high school, I ran cross country track. I have an award hanging on my wall in my room for Best Effort. I had a dog named Duffy. He would really shed. I had to sweep his hair all the time. I couldn’t believe it! Brain Injury: I was in a car accident 6 months after graduating high school. I suffered a severe brain injury that left my family WAITING for me to wake up. Everything changed. 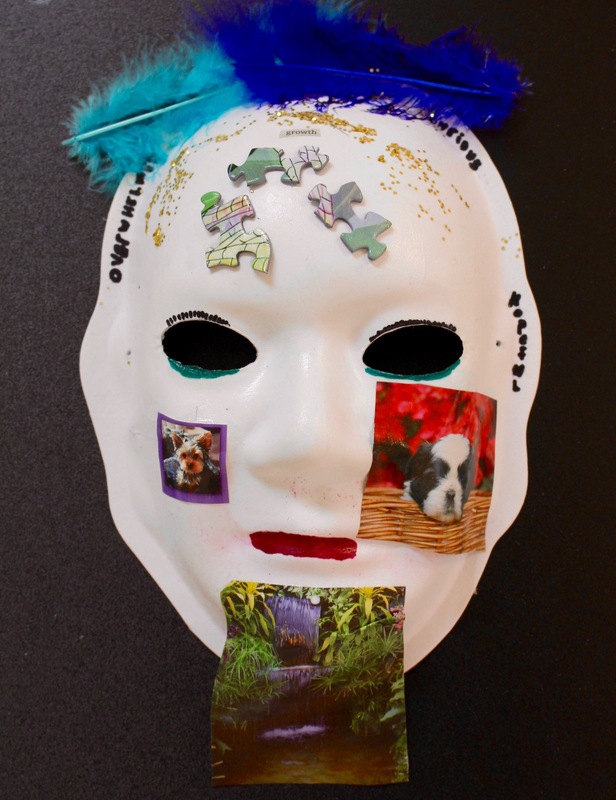 Explanation of Mask: Above the left eye, that is me, well similar… I have brown eyes and brown hair. The pink represents my life before the accident, happy and ‘girly”. I loved fashion and modeled part-time. After my injury, HOPE is all I had. The ‘P’ in hope is backwards because my life got turned around. On the nose is a dog that represents my best friend and my loyal companion. The red car on the lower chin represents the color car I had my accident in. I also danced before my injury. The strawberry represents my interest in nutrition and the degree I achieved after my injury. Making the days count is so important to me now, and laughing is what helps me through the hard times. Blue represents my sadness through the losses, and yellow is my attitude now – POSITIVE!!! Brain Injury: I died in a car wreck in December of 1983. I was driving down a road that I had driven down a thousand times before. The car flipped and I was thrown from the car. I suffered a traumatic brain injury, died and came back. I fought hard for life. Explanation of Mask: I have been in three car accidents in my life. This last one left me in a coma for 18 weeks and changed the course of my life forever. I am grateful, because clearly I’m living on borrowed time. I take life as it comes at me. I try to be responsible for and worthy of my own deeds. The words on my mask were chosen because I am so determined to motivate others. I focus on what I can do, not what I can’t. So many times I see people with brain injury become so timid and just go along with the crowd. I am still my own man with thoughts, opinions and beliefs. I work hard to be true to myself. I encourage others with brain injury to do the same. You are still the person God made you to be. We should life with intent and purpose, not just be. I have come to realize that I am a better person now than I was before my injury. I “survived” for a reason. I have much to give. Brain Injury: I received a concussion on June 2, 2005 while playing flag football at age 28. I went to the hospital to be checked out and they ordered an MRI, which surprisingly showed that I had a brain tumor. I had surgery and the tumor was diagnosed as a Grade 2 astrocytoma. I was treated at Wake Forest and MD Anderson. I had radiation to the tumor site. Six years later the tumor came back and I had temporal lobe astrocytoma surgery. Three months after that I had a brain hemorrhage, which deprived the blood supply to the tumor and fortunately killed the tumor. However, it left me with other physical difficulties. Brain Injury: Frontal Lobe Injury. I was driving home in 1989 when the tree, 3 feet at the base and 20 feet tall, fell on my Volkswagen Golf. I was 29 years old at the time. 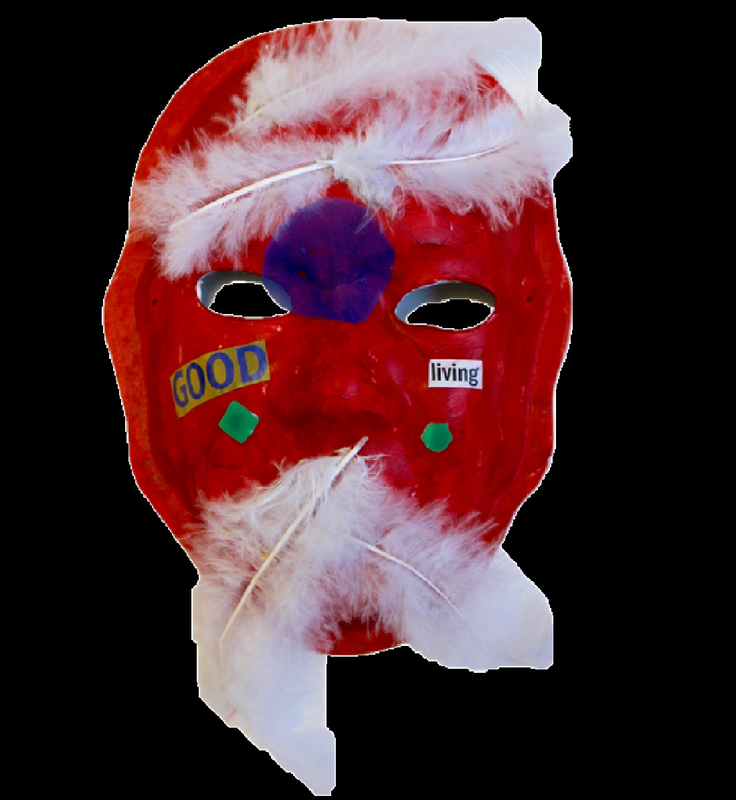 Explanation of Mask: I designed my mask with a large Australian pine tree that extends above the mask and covers the center of the mask. The tree is significant because this tree caused my injury. The words on the mask describe how I feel now. “Amazing” is how it feels to have survived this trauma. It pains me because I can do more things than people believe I can do. I have hope that I’ll be able to drive a car again one day. Brain Injury: I had a breakup with a long-time girlfriend. It was before graduation. I attempted suicide by hanging but survived. I now live with an Anoxic Brain Injury. 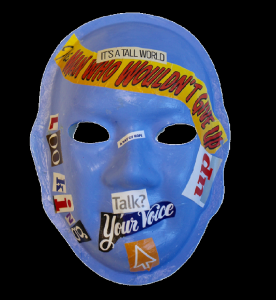 Explanation of Mask: “I wish I hadn’t ever done this. 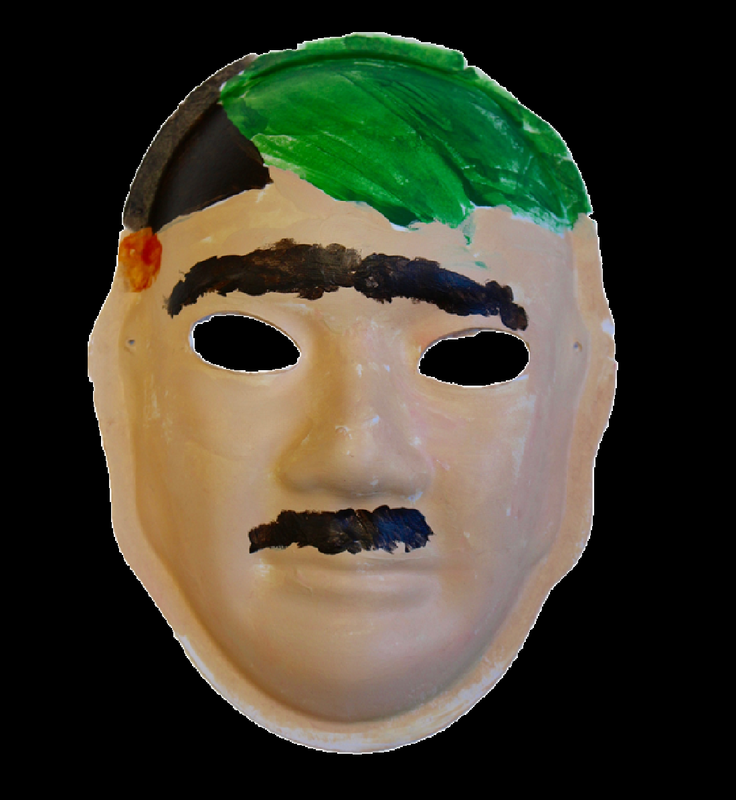 I want to tell everyone not to do this.” I painted my mask black because I was very, very depressed. The words Hurt and Death painted in white under each eye represent what I felt and what I wanted to happen. I put a red heart over the mouth with a lightning bolt in the middle because my heart hurt and broke. I want to help others not do what I did. Talk to people and get help. Therapy works. Faith and prayer are important, too. I have started a nonprofit called Chase Life, Inc. to offer education, intervention, and support to people struggling with depression. Brain Injury: Oligodendroglioma (brain cancer) with secondary injury from radiation to the left frontal and temporal lobes. Explanation of Mask: My mask represents my fractured, splintered brain and the emotions that come with the injury. Lavender is my favorite color. The rainbow represents rays of hope. Brain Injury: Traumatic brain injury that occurred on a worksite. 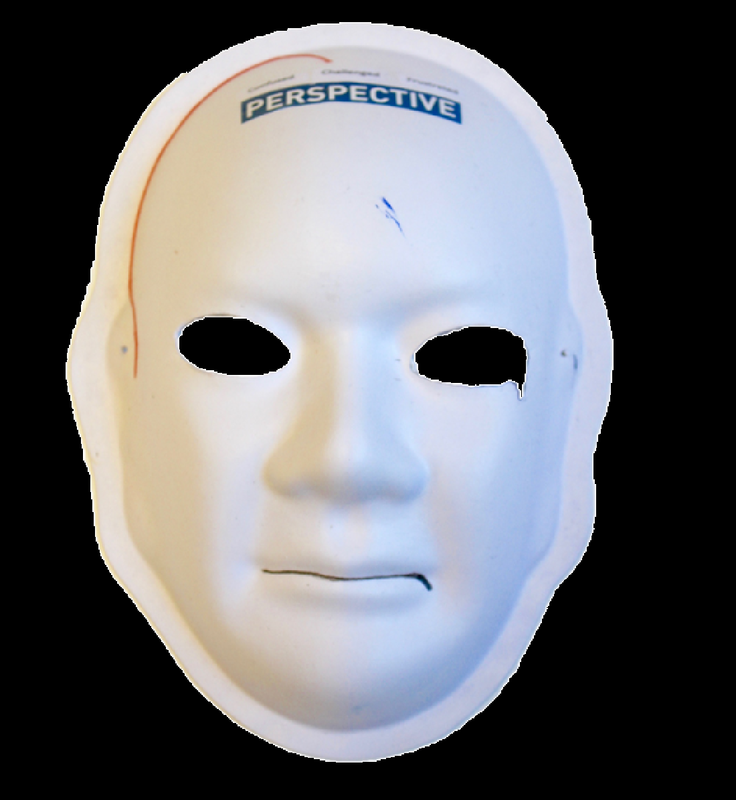 I was working as a surveyor at an elementary school when a fall occurred that broke my hardhat and I sustained a skull fracture. 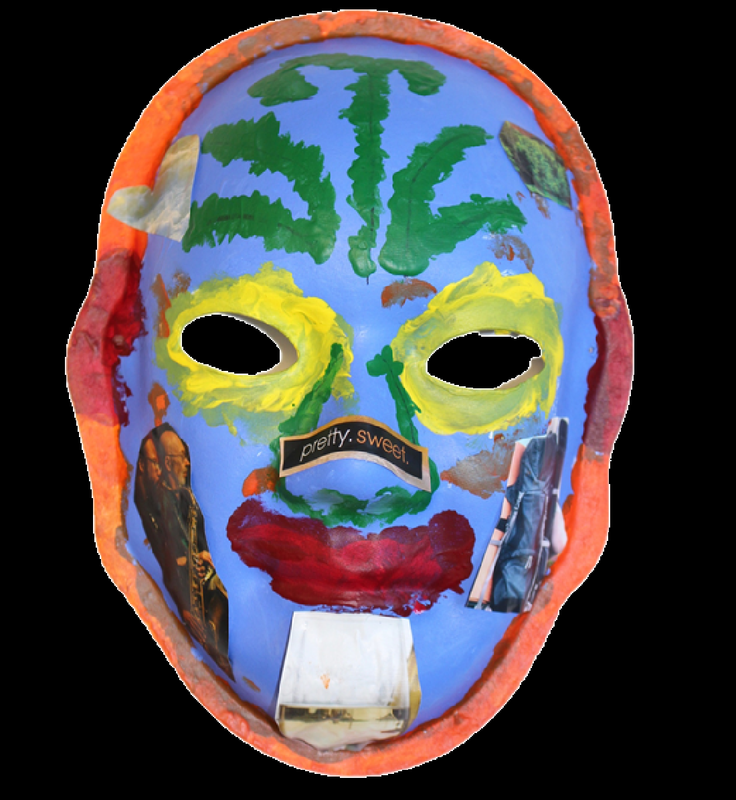 Explanation of Mask: This is a self-portrait. The green represents the hardhat I was wearing when I was injured. The orange represents the skull bone fracture. Brain Injury: My injury occurred from an auto accident when I was 7 years old. Explanation of Mask: I was born and raised in Nashville, TN. I am now 32 years old and have been living in Georgia for 4-1/2 years. My mom still lives in Tennessee near Nashville. I would like to get a job in a music store. I have been playing drums since I was a 1 year old. I play in a band called The Originals at Annandale Village and write music also. I love music! In fact, I’m named after Bob Dylan. I also love to play flow hockey and softball. Brain Injury: Traumatic brain injury from a motorcycle accident in 2010. 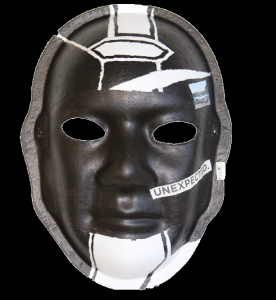 Explanation of Mask: I was heading to work on my Kawasaki Ninja. As I went through an intersection, an SUV turned towards me and caused me to wipe out. After that, I don’t know what happened. When I was taken to the hospital, they didn’t think I would make it, but I kept breathing on my own. My brain was swelling so badly that the surgeon had to remove part of my skull so my brain wouldn’t get any more damaged. The injuries were bad. I was in a coma for about 5 weeks. I was in hospitals and rehab for a long time. I wasn’t able to stand or talk. All I could say was yes and no. I have seizures, aphasia, and partial paralysis on the right side. I still go to therapy every week to continue to strengthen my body and improve my speech. I used to own my own house, two BMWs (one to drive and one to restore), two bikes (one dirt bike and my Ninja) and a truck to haul them in, and a fancy bicycle. I also had two dogs. Now I live with my mom because I have seizures and can’t do everything on my own, but I keep trying to do more. I’m still getting better, and I want to ride a Harley one day with my uncles and cousins. 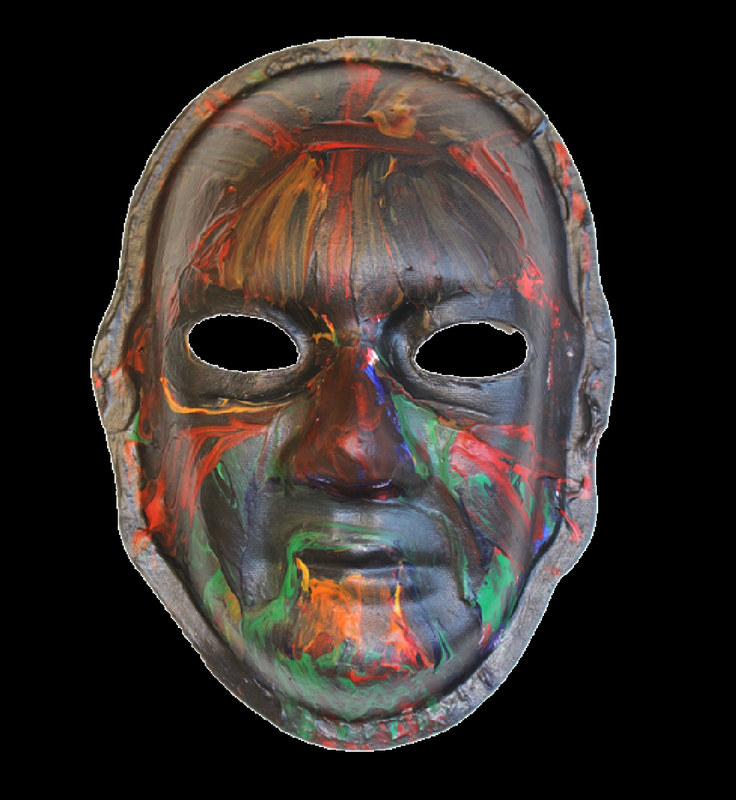 My mask is black because of the holes in my memory and all the things I’ve lost because of my accident. I am grateful to be alive, for all the things I can do, and for my family and the support I have. I miss my active lifestyle and the ability to do everything on my own. Brain Injury: I worked in construction and was hit in the head with pipes. Explanation of Mask: I like to draw and paint. I love the color pink. Pink is my favorite color. I enjoy going to the beach. That makes me happy. I love my mom and dad very much. My favorite food is carrots because they help you to see better. I like soccer but haven’t played in a while. After my injury, I wasn’t able to walk. I can again. It has been 3 years since my accident. 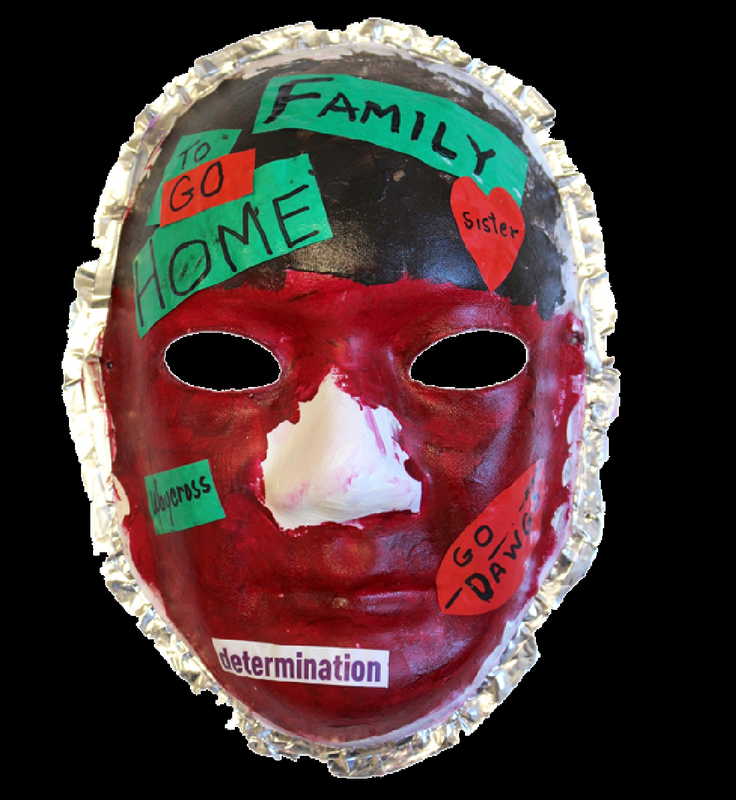 Brain Injury: When I was 9 years old, I was crossing the street in front of my house. I stopped in the median and bounced a ball. A priest in a Mercedes was driving while talking to backseat passengers and hit me. It sent me flying 3 meters into the air. I was in a coma for 6 days. Since then, I’ve gone to a psychiatrist. My memory of the accident is not there. I don’t remember life before. I liken it to being born again. I lived in Madrid for many years and then moved to Florida and Georgia with my wife. 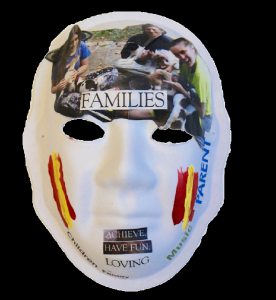 Explanation of Mask: The picture is because I like family. Colors on the cheeks are Spain where I was born, where I got the injury, and where some family members still live today. The words are some of the things that are important to me: Achieve, Have Fun, Loving. Don’t think you are unworthy because you are how you are. Try to achieve. Love everything around you: children, family, music, sports. Be grateful that you can work and raise a son or daughter. Brain Injury: I was a drill equipment operator on a construction site. A large drill bit broke and exploded. It hit me on the back of the head. 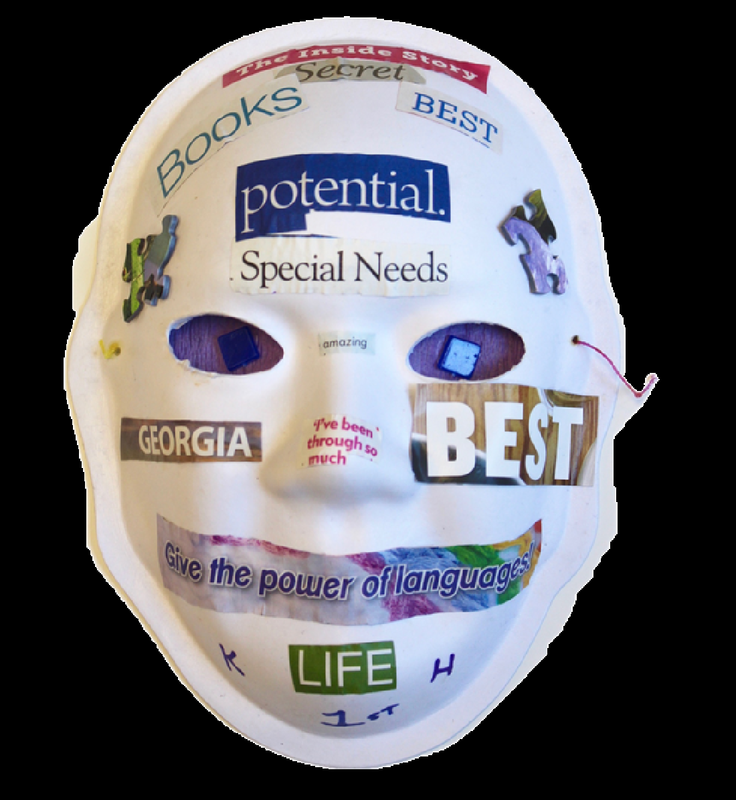 Explanation of Mask: This mask has inspirational words to help other people who have accidents. Nothing is over; it’s just the beginning. Brain Injury: I used to drive a 1970 Monte Carlo. I was hit head-on by a car going the wrong way on the Interstate. It is a good color. I like the Georgia Bulldogs. Brain Injury: I am 13 years old. I was hit by a car on Long Island 2-1/2 years ago when I was 10. 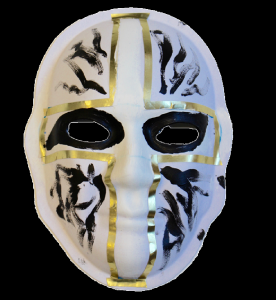 Explanation of Mask: The black on my mask represents darkness of things in the past. The white represents my present feelings and current events. 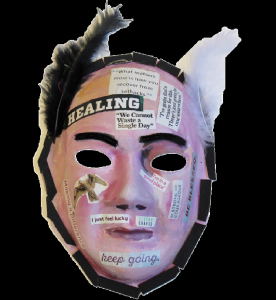 I feel many emotions – depressed, upset, hurt, and frustrated that I can’t do previous things. I have many unexplained feelings that cause anger. I am happy when I play basketball (no running) and video games. I like to chat and Skype with friends who have supported me. I like to go back to visit relatives in New York. I really enjoy art and drawing cartoon characters. Lately I feel like a normal kid. I have a lot of friends, family, and teachers that support and encourage me. I am thankful for life and for my parents. Brain Injury: When I was 10 years old, I went out to ride my 10-speed bike with my sister. I turned my head to tell my sister to stop, hit a bump, and went over the handle bar, hitting the pavement. I now live with a closed head injury. Explanation of Mask: My bike wreck changed my life forever. I am now 43 years old and living at Annandale Village away from my family. I am happy, but I miss my home in Waycross. I want to be with my family. Family is very important to me. 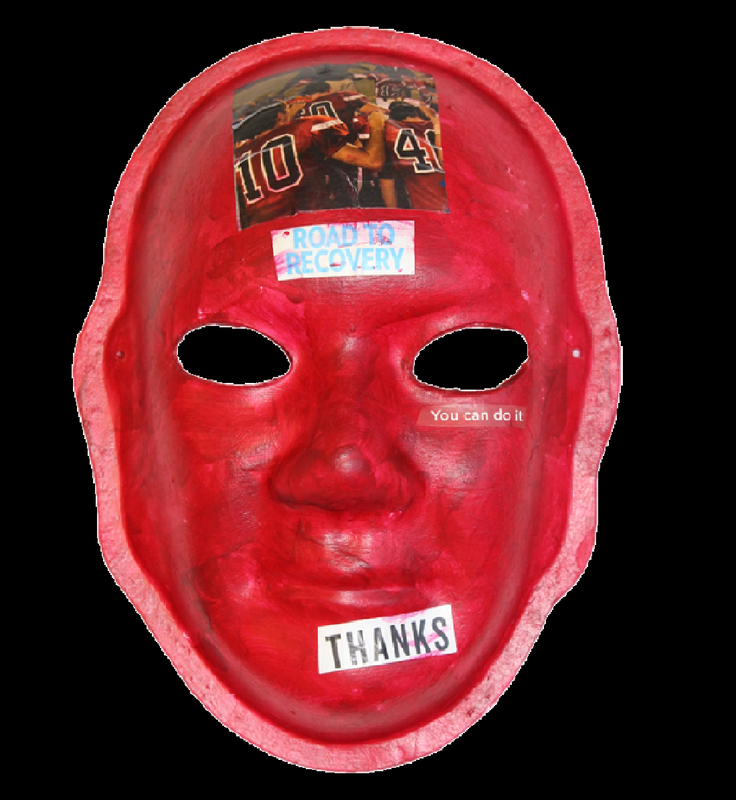 The red color on my mask represents my love for the Georgia Bulldogs. I’m a big fan! Red makes me happy. I am a very happy, friendly person who smiles a lot. I like to make other people happy, too. Brain Injury: Head injury in 1978. I was 18 years old, coming home from Savannah with a friend. It was raining. I was “scared to death” as I lost control of the car. I had a bad accident and hit my head on the metal post on the car, which split my head open. My friend called 911. I was in a coma for 4 months. I had surgery on my head and went to rehab after I came out of the coma. I also had a lot of speech therapy and physical therapy. 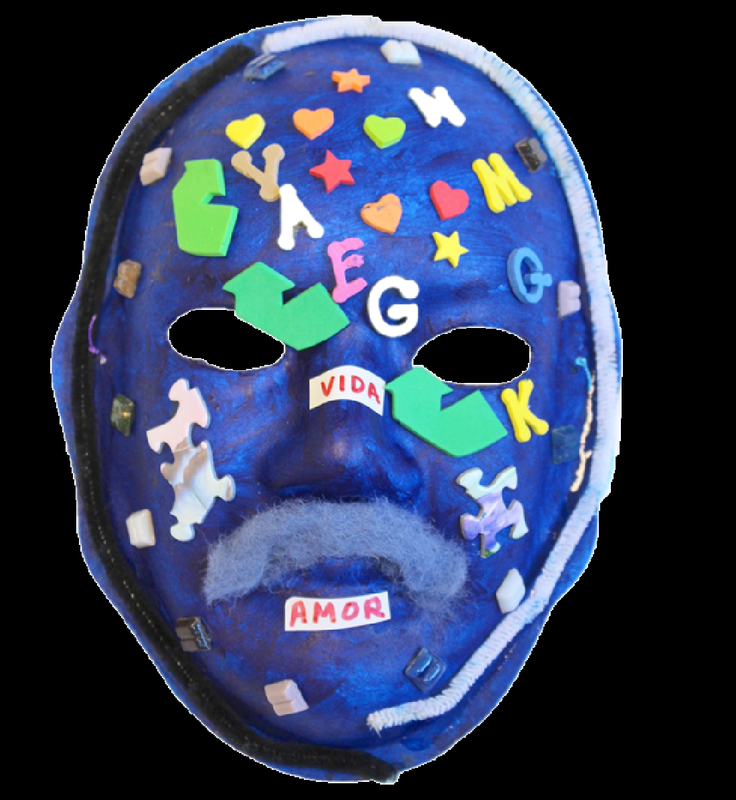 Explanation of Mask: My mask represents my mom and dad’s love. I felt guilty because my mother and father had to take care of me. I have a sister and a brother that they have to take care of, too. I feel like I killed my mom & dad. I am still not over the accident. I get sad and feel blue. My mom did not want me to go on the trip. I feel apprehensive that I can’t move on and get over the accident. The cut on my forehead was open for a while when it was healing. Now I have a scar on my forehead. The scar is a “symbol” of how I let my mom down. I wanted to go to college and be a nurse. I never realized my potential because I was so young. I played basketball when I was young, but now I’m uncoordinated, have shakes, and cannot play. It is hard for me to display my emotions since the accident. I just live and keep trying to do my best. 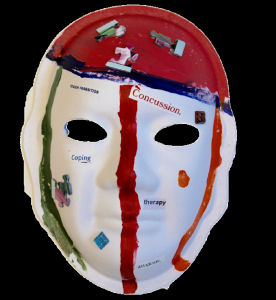 Brain Injury: Traumatic Brain Injury from a car accident in 1995. Brain Injury: Unknown sudden illness at 16 years old. We will never know what attacked my body and caused my injury. Brain Injury: Diagnosed with Cerebellar Neuroblastoma Brain Tumor shortly after my first birthday. I have multiple secondary Radiation Induced Meningiomas (brain tumors) and other late effects from original radiation treatment. Explanation of Mask: When I was 15 months old, I experienced symptoms of lethargy and projectile vomiting. After repeated visits to the pediatrician and being sent home with my “over-reactive” parents, I was admitted to the local hospital and given an MRI. The scan revealed a large cerebellar mass and I was rushed at midnight in an ambulance to Children’s Healthcare for emergency brain surgery at 2 AM. I then underwent a craniotomy 3 days later that removed approximately 70 % of the tumor. I was treated for 2 years with heavy duty chemotherapy, and then received 30 radiation treatments to my whole brain and spine shortly after my 3rd birthday. I have a lot of secondary issues from the original treatment, including at least 6 current secondary radiation-induced meningiomas. We treat them when they cause problems, and in the meantime I live my life to the fullest. 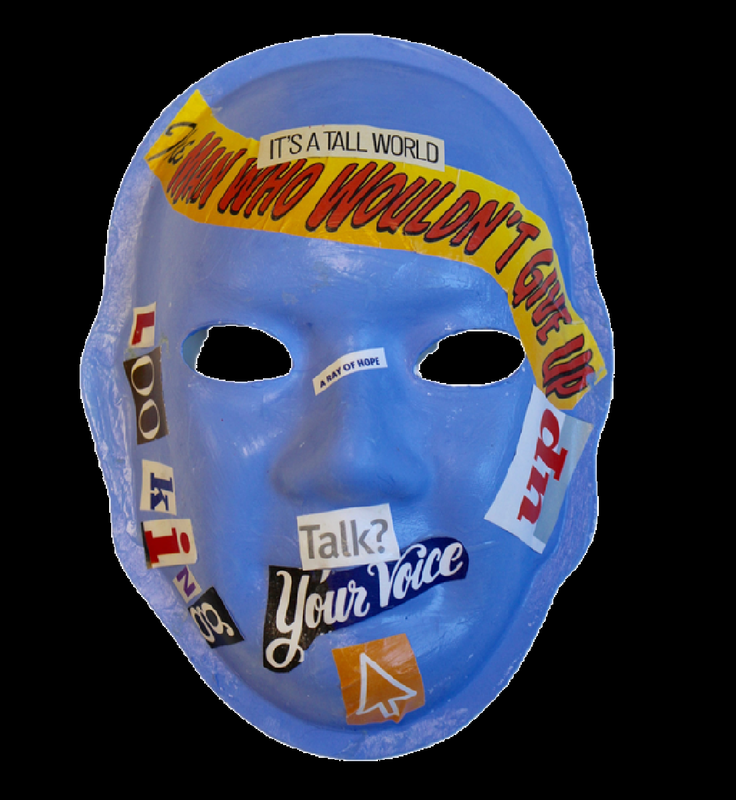 My mask represents the pros and cons of being a childhood cancer patient, and the experience of all the secondary health issues from the original treatment. 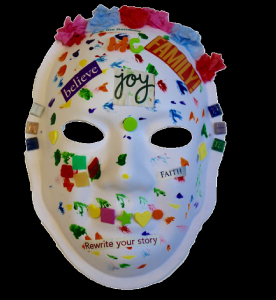 The left side of the mask represents the pros of my cancer journey and it transitions from top to bottom into the joys and enjoyments that have helped me navigate my cancer journey. 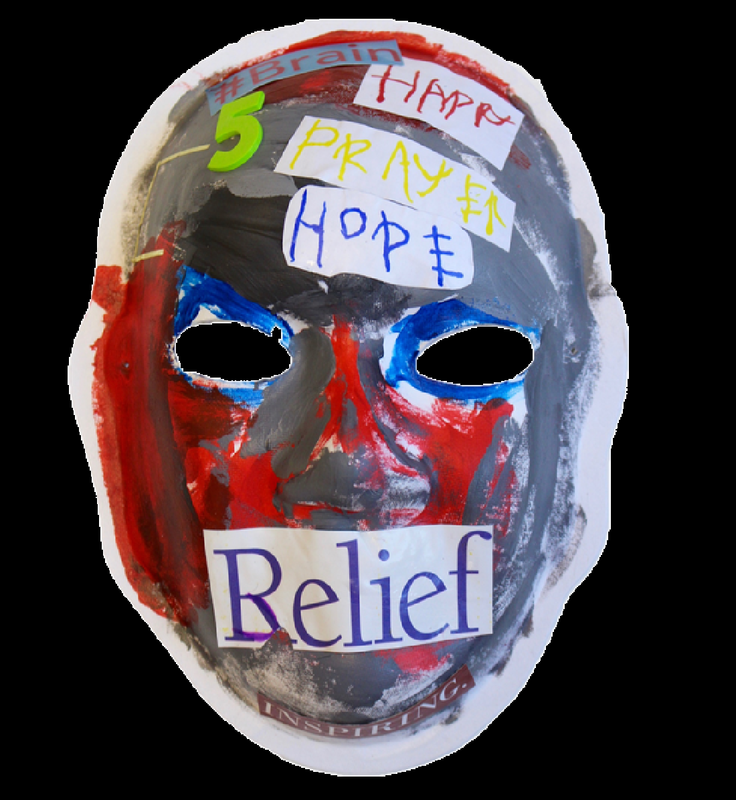 The pro side also overflows to the inside of the mask, where I share extra positives and what makes me happy. 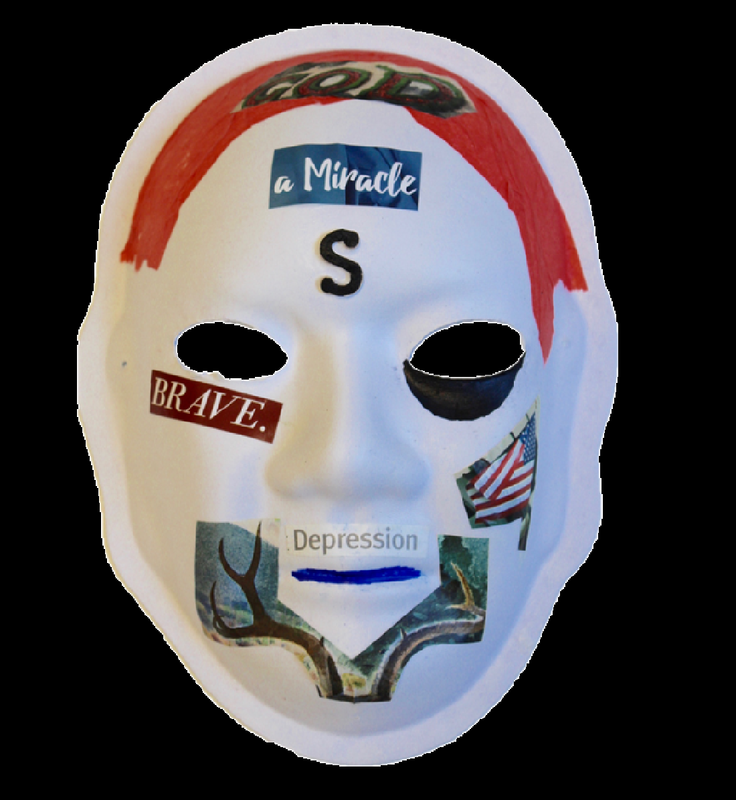 The right side of the mask represents the con side and the hardships, isolation, dislikes and wear and tear on the body that I have endured from having cancer at a young age. My favorite color is yellow, represented by the yellow feather. 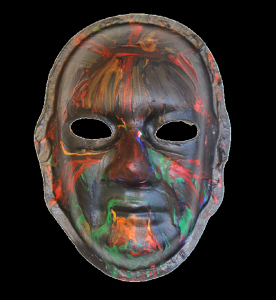 The glow in the dark paint on the con side represents the radiation treatments. The wire and pipe cleaners are symbolic of all the scars that I have earned through my battle, but the scars have made me a stronger person. Scars are my stories, history written on the body. The eye prism on my left eye represents the most recent Proton Radiation treatment that I had to the tumor that was causing strabismus. I was sent to MassGeneral in Boston for 6 weeks of treatment, and we had the time of our lives enjoying the top-of-the-line medical care and the rich history and cultural life that the city of Boston has to offer—a very overall positive experience! The heart stone with the hole represents the hole in my heart from those friends and loved ones that I have lost to cancer. The ducks and duck feather represents my dad, who is “Uncle Duck” to all his nieces and nephews. He lost his own battle to cancer when I was 17 years old. Brain Injury: Traumatic brain injury and anoxic brain injury resulting from a car accident. The red is for anger for the car accident and the loss of memory and depression. God is #1 in my life. That is why He is up top. 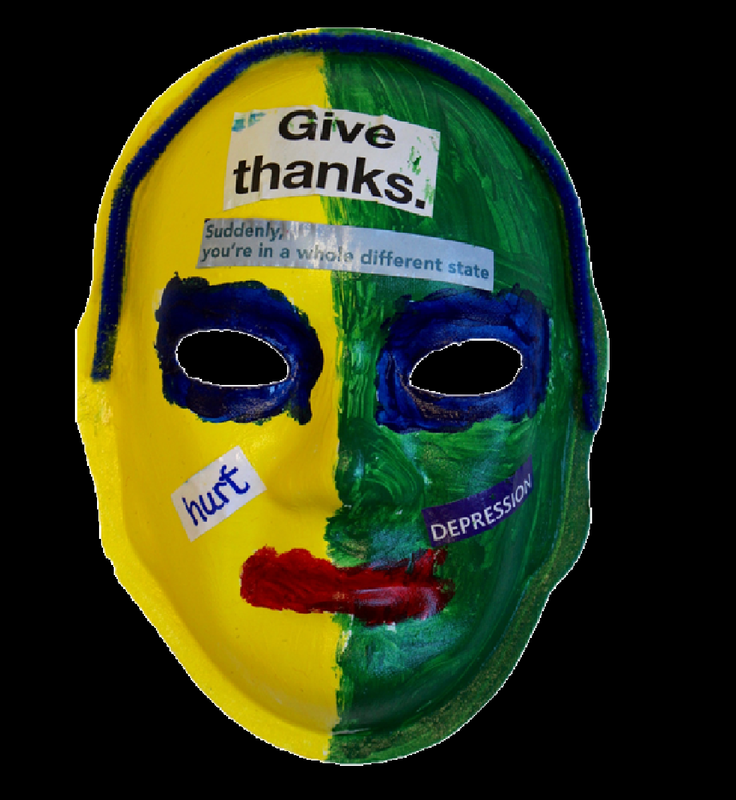 Depression: I fought depression really hard. Brave: I’ve had to be brave to deal with all the shortcomings and challenges. Miracle: I died but was brought back to life. It’s a miracle that I’m still alive. American Flag: We’re in America, and I love my country. Deer Rack: Because I love to hunt. Prior to the accident, I was an Event Planner at a major hotel. The color would be purple, my favorite color. I was then in a car accident that, of course, changed my life as well as my family’s. That color would be black, representing the unknown and what my future would be. Two years after the accident, I got married. The color white represents happy times again. Several years later, I was divorced and the color black returned. Since that time, I am learning to live with a TBI. Sometimes it is difficult. I have a wonderful support system through family and friends and a beautiful 4-year-old niece who is so much joy. 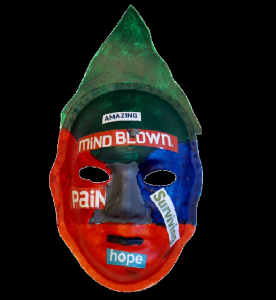 Most recently, I have been involved in a brain injury support group called New Beginnings. We meet monthly. I have met a lot of amazing people. My color is now back to purple. Brain Injury: I fell from a tree while working as a tree cutter at age 25. I was in a coma for a year. 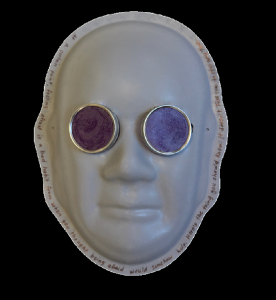 Explanation of Mask: The mask shows initials; mine, my wife’s, and my two daughters. The puzzle pieces remind me of school. I like the color blue. It makes me feel positive. I wanted ‘amor’ (love) on my lips because I want to share love with others. 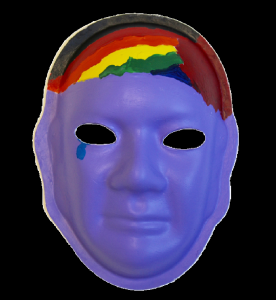 Explanation of Mask: Blue represents the car I was working on before my accident. 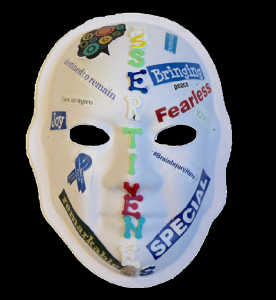 The words on my mask are a reminder to not give up and to keep on trucking! 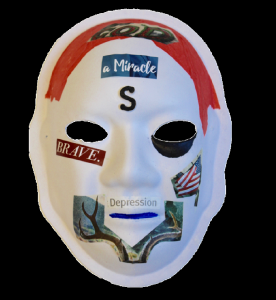 Explanation of Mask: I had a stroke on January 28, 2016. I don’t remember much of the week or two before or a couple of weeks after. I woke up a couple of days later in the Neuro ICU. There were no warnings. It is so hard to express and depict this journey I’m on. I just try to keep it all in perspective. I am alive. Brain Injury: Traumatic brain injury from an accident that occurred during work in a car. 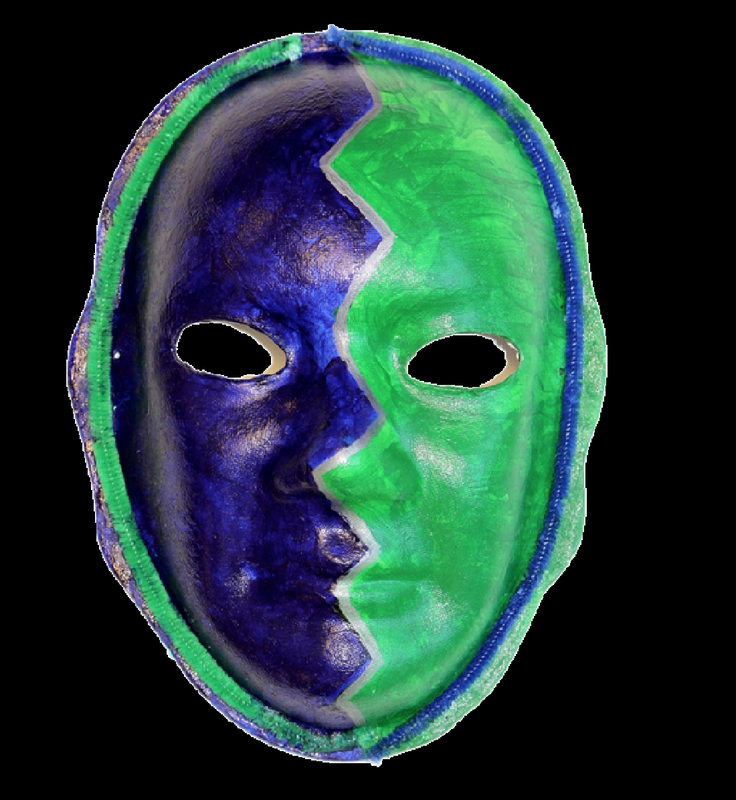 Explanation of Mask: Blue and green are some of my favorite colors. My mask is a blank slate. I started a new life and am still working to improve. I’m making progress. 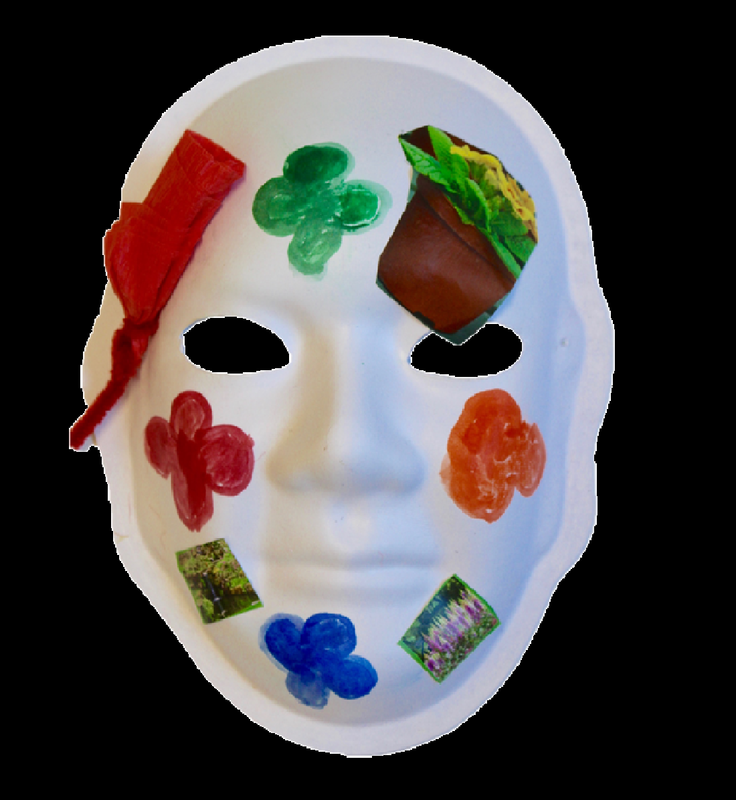 Explanation of Mask: I love flowers. They make me feel… Appreciated, Calm, Cheerful, Cherished, Courageous, Creative, Easy, Exhilarated, Irresistible, Joyful, Lovable, Optimistic, Peaceful, Proud, Relaxed, Wise, Wonderful, Stable, Good, Interested, Trusting, Fun, Happy, Able. Flowers bring beauty into my life. Brain Injury: In 1969, I fell off of a water tower in Maryland when I was 19. I had been drinking, and it just happened. I was working for a circus with the carnival crew. Years later, I was operating a curb machine when I hit a large rock and was thrown into the air. I landed on both hands. Both wrists were broken, and my hands were detached from the wrists. 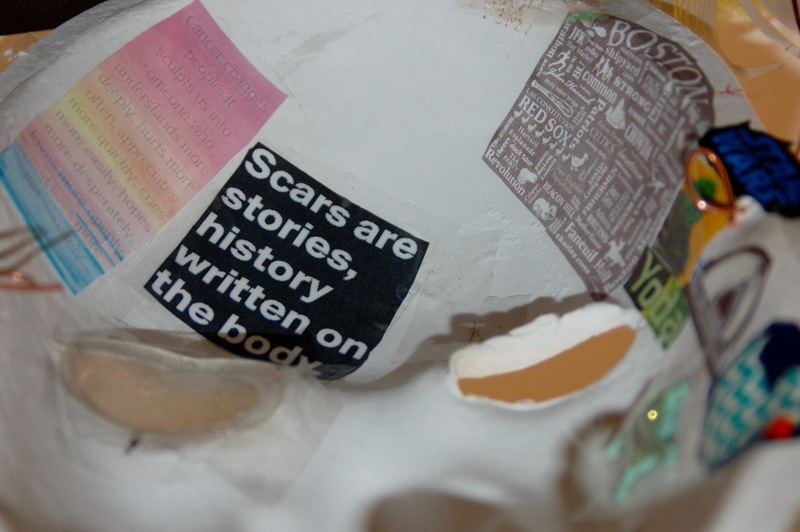 They were reattached, and the scars remind me daily of that airborne ride. Then another accident happened, which caused me to break my shoulder and clavicle bone. I still ache from the discomfort today. 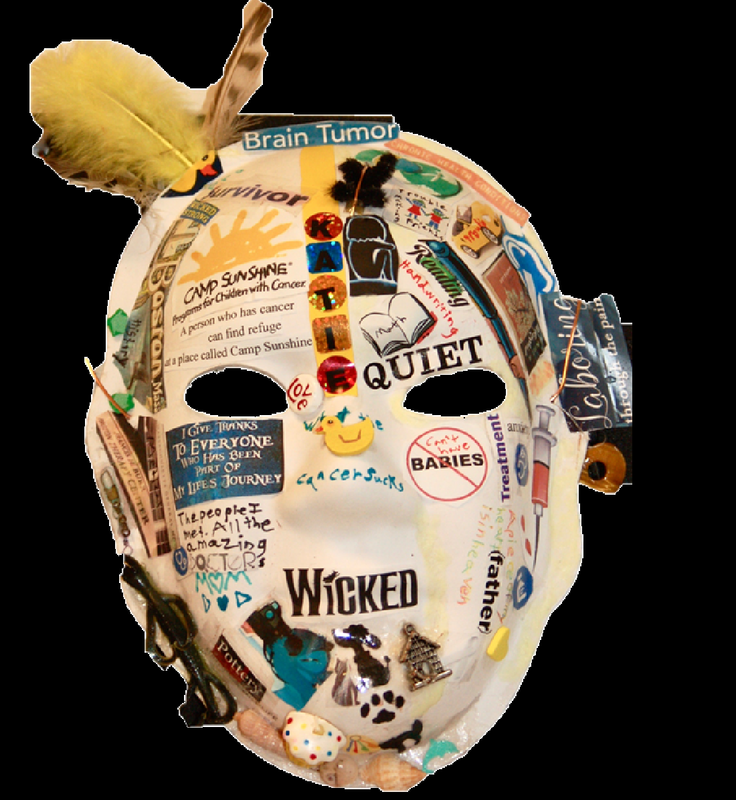 Explanation of Mask: What word describes my life with a brain injury? LUCKY! Even though I’ve had many surgeries throughout my life, I still feel like a very healthy man. I have joy, not bitterness. My experiences have turned into wisdom. 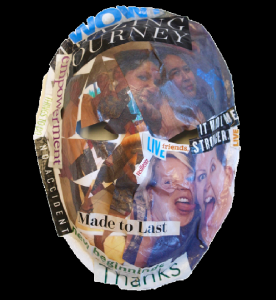 My mask represents my current life; no need to dwell on the past. I chose the color red to surround my brain because I had vibrant red hair in 1969. 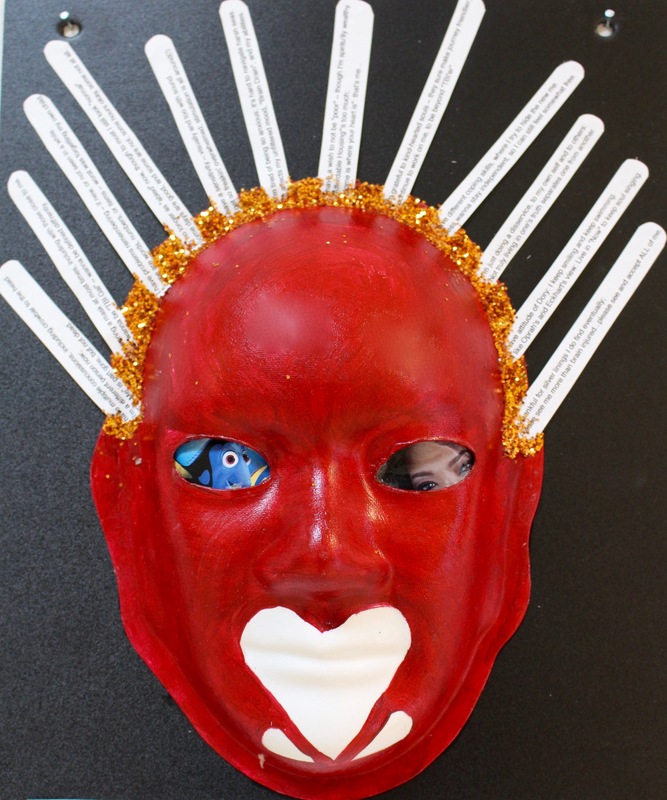 The eye slots represent the beauty of my blue eyes, along with the red & gray whiskers I put on my mask. The water tower represents where my brain injury journey began. Brain Injury: Sports Concussion that resulted in permanent scarring on the right frontal lobe of my brain that left me with a visual and seizure disorder I will manage for the rest of my life. Explanation of Mask: The gray color of my mask represents the color of my brain. The gray matter that powers my whole body, my whole being. 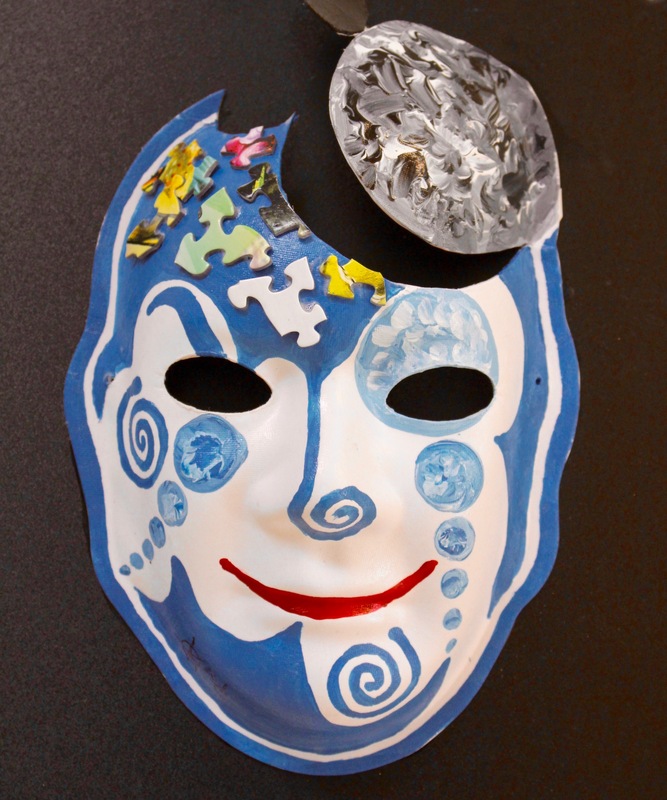 The gray matter that was altered and left permanently scarred from my concussion. The gray matter that has had to reroute, relearn, and redefine who I am. 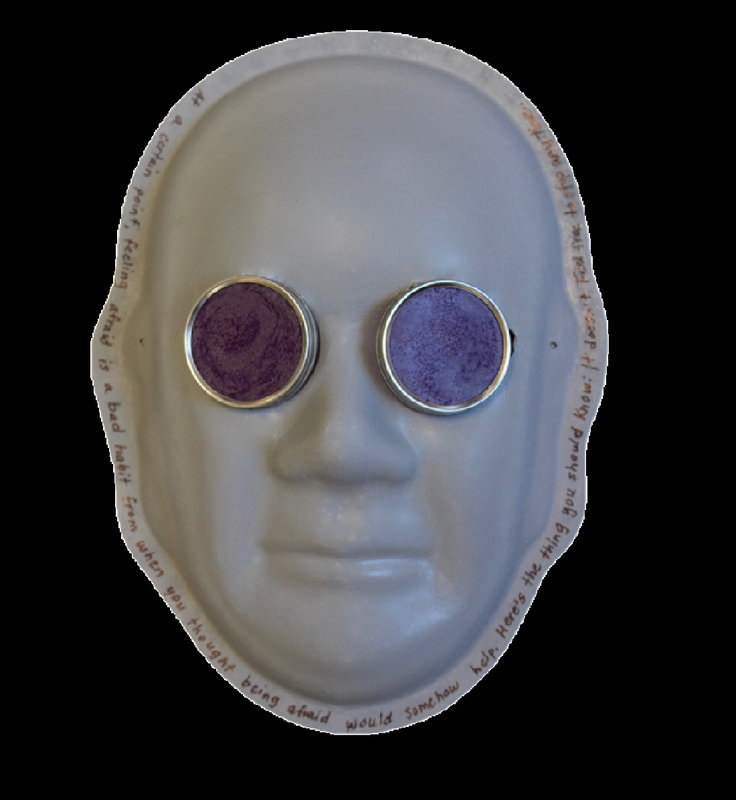 The purple lenses on my mask represent the purple tinted glasses I now wear to help my brain properly filter light. The glasses help my brain to see more clearly and vividly. Like manually focusing a picture when the autofocus won’t seem to work. The tint makes reading and comprehending doable again. It gives me security in my abilities. The quote encircling my mask are words of hope strung together. Words I cling to about my fight with fear. Words that beautifully shatter a once condemning, pitiful grip on my life. You could say my brain injury was somewhat of a matchmaker for me and fear. It was my worst enemy and yet, at times, my best friend. Always there, encroaching into every hall of my brain. It spoke words of sorrow, regret and doubt to me about not remembering, not being able to do things that I was once capable of, losing my way of life, losing friends. Fear walked with me as I faced the reality that I was no longer the Rachel I once was and had to redefine who I would be. I wear this quote on a bracelet every day. It is a physical reminder that fear is foolish. Yes, foolish. Fear is only capable of controlling me if I allow it. And why would I do that? For those battling with fear, I share my words of hope with you. Please know, it is not “just a concussion.” It’s a brain injury. And It can be life-changing. Brain Injury: I was injured in 2007 while cutting trees in a bucket truck. I was hit in the head by a tree. Explanation of Mask: The color red represents my name “Red.” The flag represents my love for the New England Patriots. I am cheering them on in the 2017 Super Bowl. I feel good and am happy. I love to hear people say hello. 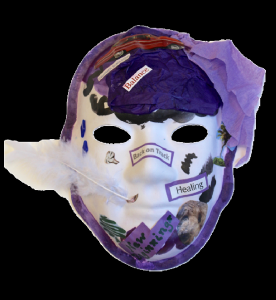 Explanation of Mask: Brain injury has made me more conscious and aware of things. 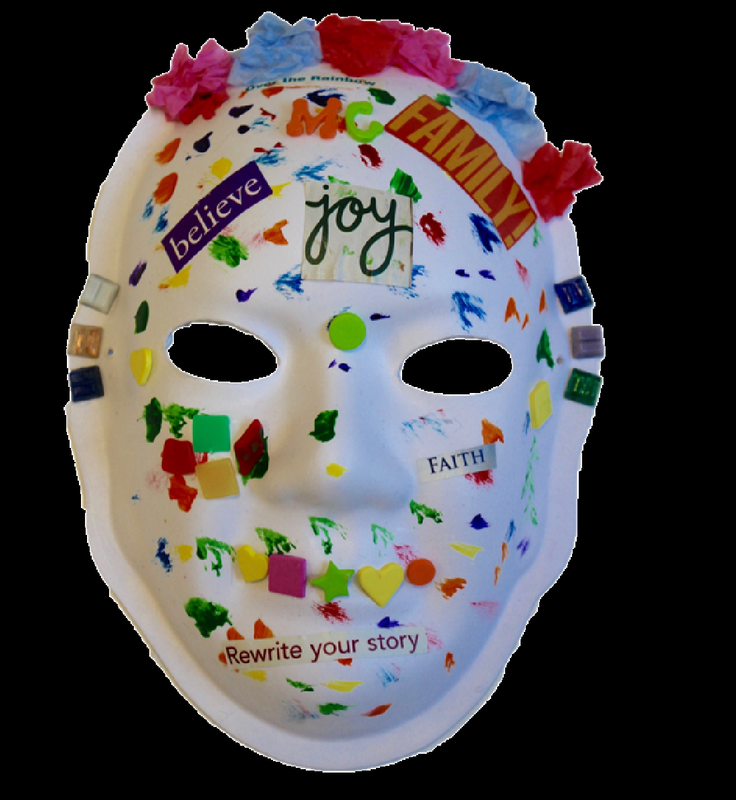 My mask represents freedom, loyalty, friendship and kindness. I have a good life. I am hopeful for a full recovery someday. Brain Injury: I was 27 years old, building a great life for myself. I worked for American Express. After work, I went to the Rec Center to play a pick-up basketball game with friends. I was playing point guard, and a guy ran over me. I fell backwards and hit my head. I was rushed by ambulance to the hospital. I had a brain bleed and damage to my brain stem. I was in the hospital for 3 months. My family came to be with me. Explanation of Mask: The mask is a means of communication. It draws attention to my never- ending plight of writing. 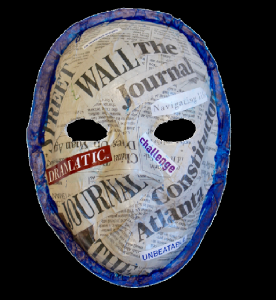 The newspaper is symbolic of societies’ occurrences documented for our review. I love to write about the humorous side of people’s happenings. 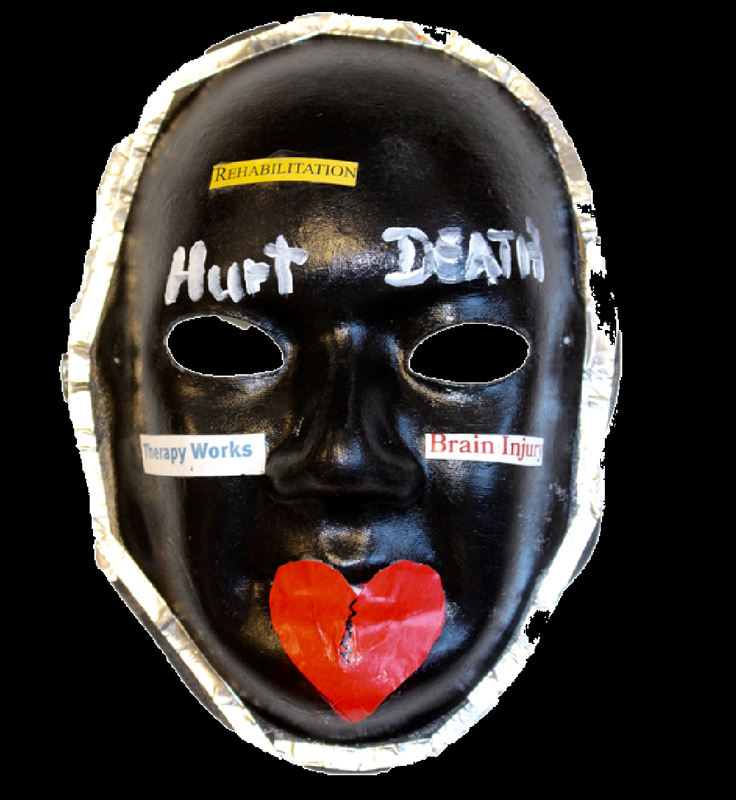 Brain Injury: I got a traumatic brain injury while working. We were driving across a bridge and a truck hit us head-on. An asphalt rod came through the back window and hit me on the head. Suddenly you’re in a whole different state. I volunteer on a horse farm and walk dogs. Explanation of Mask: The left side of the mask is before my TBI; normal, career, purpose. After the accident, the colors of my world changed to the dark side. The man on the resume died. I experience fear of not doing my best, and I still hide. I know who I am, but I don’t like me. Brain Injury: A survivor of stroke for a little over two years. Explanation of Mask: Puzzles are confusion. 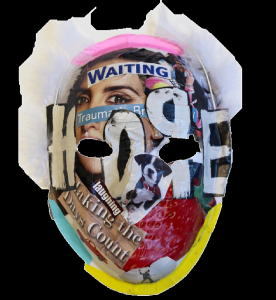 Feeling overwhelmed, curious and hopeless – then hopeful. I felt challenged at the beginning. Glitter represents my hair and I like blue (feathers). Dog pictures represent cuteness and the smaller one looks like my dog. Waterfall represents freedom. I have multiple concussions, including crowbar to the head. I’m a different person now; “Old Me” is part gone, but not dead. 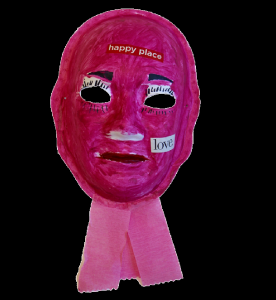 I’m wearing a mask at most times, including with those close to me. Don’t wanna be “TBI Gal” ~ wanna be defined diff’rently. I have problems remembering ~ if new, or not seen in a while. Some are words, numbers, or items ~ worst was forgetting my own child. I’m no longer as “abled” now, though to most I still look “normal”. Some days are good, and some are not; some hours okay, some not at all. I have a sensitivity ~ visually and too with sound. I’m tired of being so anxious; it’s hard to navigate harsh seas. It affects my unfiltered mood, “Brain Drain”, and my abilities. I have a wish to not be “poor” ~ though I’m spiritu’lly wealthy. I continue to work on me, to be beyond “TBI’er”. 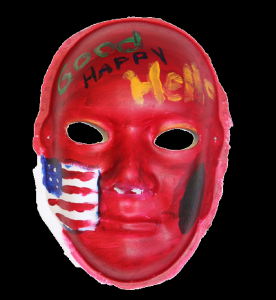 I have different coping skills, where I try to hide the new me. Guess wanna stay independent, so I can still feel somewhat free. Not truly living in one’s truth separates one from another. I have attitude of Dory: I keep smiling and keep swimming. I like Oprah’s and Eckhart’s view: Live in “Now” to keep soul singing. Please see me more than brain injured…please see and accept ALL of me. Brain Injury: Car Accident 6/3/2013. I was driving cross-country moving from San Diego to Atlanta and the accident happened in the middle of the desert of El Paso, Texas. My car flipped 3-4 times and crossed over the median divide, and then across two lanes of the highway going the opposite way. Luckily no one else was involved or hurt. I had my two dogs in the car with me. One of them was thrown from the car and took off running into the desert. I never found him. My head hit the driver side window, causing an open wound in my scalp. My left arm was dislocated, a bone broken in the elbow area, and severe “road rash” from the forearm area to the top of my bicep area. Also had multiple wounds on my arm from ground debris and glass. I fractured my C4 vertebrae in my neck, had a small face fracture in my right cheekbone, and a small left rib fracture. I don’t remember much from the accident except the car losing control, chatting with the Paramedic as though we were having a casual conversation, and seeing one of my dogs in his cage. I also remember a strange woman speaking a language I could not understand, which to this day, I truly believe was a Guardian Angel there with me at the scene of the accident. My parents were driving along the route in a different vehicle ahead of me, so we weren’t in view of each other when the accident happened. For some reason, they decided to turn around because they didn’t see me behind them and actually drove up the opposite side of the highway discovering the remnants of my car with the police still there to let them know what happened. My Fiancé (now Husband) was two days behind me still in San Diego, finishing up things to make his move out to Atlanta too. He got a call from the Paramedic who was with me in the ER, and he immediately dropped everything, had family members finish up his moving needs, and started his nonstop drive to the hospital in El Paso. 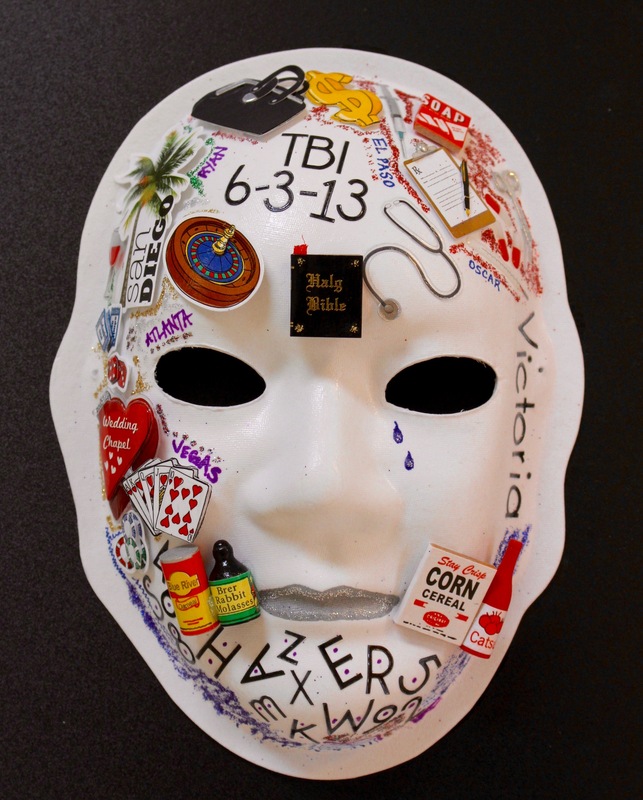 Explanation of mask: The Bible at the center of my forehead represents God being a big part of my ongoing recovery process, the presence of Him, along with the Guardian Angel that protected me during the accident. In my opinion, there is no earthly explanation that a person would have been able to survive what happened in my accident. 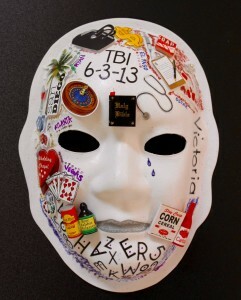 The date shown at the top of the mask is when my TBI happened, with El Paso noted too. 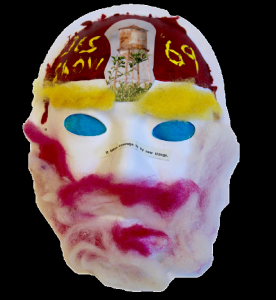 On the left side of my skull is where the majority of the TBI external injury happened, and it is represented by the medical items, with red for the bleeding from my scalp, and glitter is for the pieces of embedded glass that are still coming out, almost 4 years later. The dollar symbol is for the medical bills and no resources available for financial assistance. I was a single without insurance. The pill capsules represent the pain medications that were so easily prescribed to me. I hated how they made me feel – mentally zoned out, high, and spacey. “Oscar” is for my dog that I lost in the accident. The blank white background with my name in plain letters on the side represents the former independent, intensely goal-driven “Me”. The Me that “died at 35” in the accident, and the clueless feeling of figuring out this new Me that appeared after my TBI. The blue tears under the left eye represent the episodes of guilt, grief, sadness, anger and frustration. Around the mouth are food items, because I learned that what I ate had a significant impact on my brain health/TBI symptoms flaring up. I also found a new “job” in cooking for my Husband and me, as a fulltime Housewife. 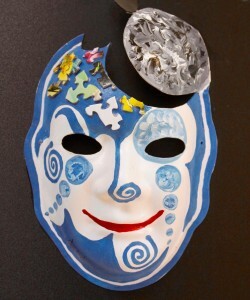 I tried but was unable to work a traditional job with the symptoms/challenges of my TBI. 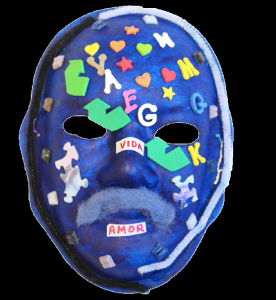 The grey mouth represents the difficulty in translating mental thoughts into words, and the jumbled letters/numbers are how it feels trying to think of the correct words to communicate verbally. The blue color near the neck is for the neck brace I wore for 10 weeks, the feeling of suffocating that it gave me and the panic that woke me up most nights. On the other side of the mask are symbols of my glittery, dream-like, Las Vegas wedding in November 2014; a huge milestone in my life. “Atlanta” is there because that is my home. San Diego represents where I met and was engaged to my husband. The wine glass is for the old me that enjoyed a nice glass of wine. After my TBI, I cannot drink because it flares up the symptoms and sets me back in my recovery. I am 100% medication free and try my best to use food, nutrition, holistic and natural approaches to maintain a healthy brain and body. Since my TBI, family members struggle to understand the effects of my TBI, pretend like nothing major has happened, make me feel judged, rejected, excluded, and tried to convince me that I am crazy. My husband’s name, Ryan, is near the top of the mask. He is the only person in my life to truly stick by my side during my ongoing recovery process, TBI challenges, and my moments of exhaustion, sadness, rage, and aggressive outbursts. When I think back on everything that happened since my accident, Ryan is the only person who has consistently been there for me, while others were quick to give up.